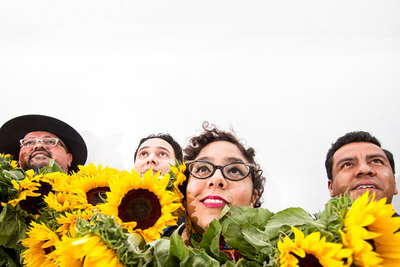 La Santa Cecilia started their career by serenading passersby on Los Angeles’ historic Olvera Street. La Santa Cecilia is a musical phenomenon that defies musical and cultural boundaries. 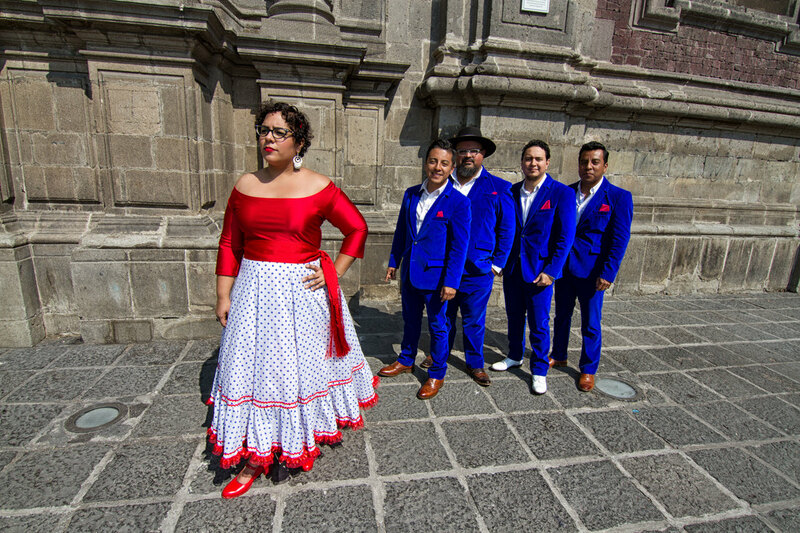 Named after the patron saint of music, La Santa Cecilia is composed of accordionist and requinto player Jose ‘Pepe’ Carlos, bassist Alex Bendaña, percussionist Miguel ‘Oso’ Ramirez, and vocalist ‘La Marisoul’. With a captivating voice that sings about love, loss, and everyday struggles, this band has become the voice of a new bicultural generation in the United States, fully immersed in modern music, but still close to their Latin American influences and Mexican heritage. They have won a Grammy; toured from coast to coast; collaborated with legends including Elvis Costello, Bunbury, Fito Paez; appeared on Conan; and shared the stage with Led Zeppelin’s John Paul Jones and Pepe Aguilar. They followed that album with the eclectic El Valor in 2012, which was named one of the best albums of the year by NPR’s Alt Latino. This was followed by their major label debut Treinta Días. The album was recorded in 2013 and showed the band moving in a more sophisticated direction, while holding true to themselves. They combined cumbia, reggae, soul, tango, and their L.A. spice to create an album that went on to win the Grammy for Best Latin Rock Album, Alternative or Urban in 2014. The album featured the anthem “ICE (El Hielo),” which brought to light the struggle of undocumented immigrants in the US. The compelling video for the song humanized the controversial topic of immigration. It received accolades from major media outlets around the country, and was nominated for Video Of The Year at Premios Lo Nuestro. national anthem to the over 1,500 Latino leaders in attendance. Later that summer, the band played the sold out Reventón festival for over 20,000 people. On March 27th of that same year, the band opened the legendary Vive Latino festival. La Santa Cecilia’s music then hit the big screen. They recorded the song "Tu Vida Es Un Escenario” for the award-winning film Cantinflas, and collaborated with two-time Grammy winner Gustavo Santaolalla on "The Apology Song" for the animated hit film "The Book of Life," directed by Mexican director Guillermo del Toro. The band’s songs have also appeared in popular TV shows like Weeds, Entourage, and The Bridge. La Marisoul was also featured as a guest performer on Pepe Aguilar’s MTV Unplugged, which turned out to be the first Unplugged by a Ranchero artist. Pepe Aguilar later invited La Santa Cecilia on stage at the National Auditorium in Mexico. She was also invited to sing with The Roots and Elvis Costello on their highly acclaimed album Wise Up Ghost. In 2015, the band released the song “I Won’t Cry For You,” produced by 17-time Grammy award-winner Sebastian Krys. The song is a fusion of traditional swing and norteño, continuing LSC’s long tradition of genre-bending music. "Calaverita" was released that fall. The song is a tribute to the great Mexican tradition of the "Day of the Dead" – in celebration and of those we’ve lost. 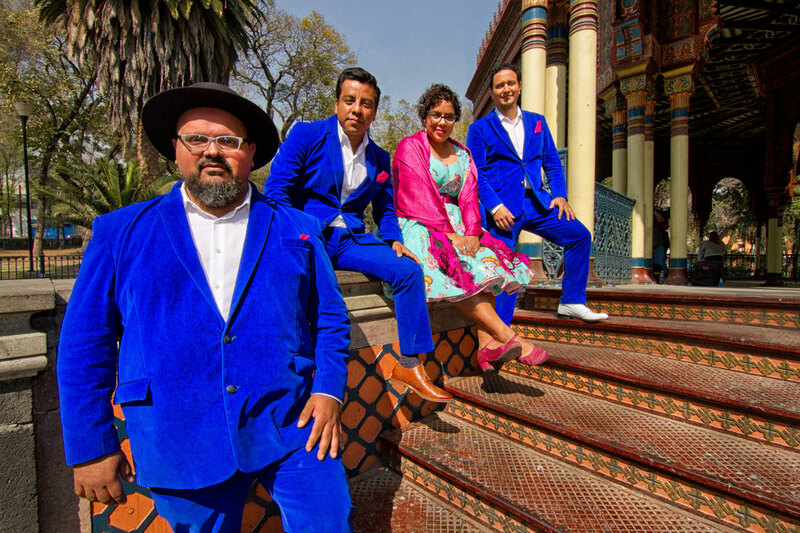 Buenaventura was released February 26, 2016 and is an album in which La Santa Cecilia express their gratitude for making music, traveling and performing throughout the world, and living a life filled with love and music. The album was nominated for a Latin Grammy in the Best Pop/Rock Album category, and was nominated for a Grammy in the “Best Latin Urban, Rock or Alternative” category. The album includes the rousing anti-violence anthem “Nunca Mas” which was performed at the 2016 Latin American Music Awards and Hispanic Heritage Awards. In January of 2017, the band again broke new ground by recording a unique visual album of traditional Mexican and Latin American music titled Amar y Vivir. The 12 song set was recorded entirely live in 5 days in the streets, bars, and parks of Mexico City. The visual album is an exploration of the bands roots and counts with the collaboration of the iconic Mexican singer Eugenia Leon, Chilean star Mon Laferte and the legendary Mariachi America amongst others.